Teak! It’s one of our most popular AquaMat® carpets and it’s gaining in popularity with every season. The look of teak flooring has become a genuine craze among many boaters. Our AquaLoc® backed snap-in style carpet adds the look of the classic wooden floor, but with the plushness underfoot you expect from the finest marine carpets. 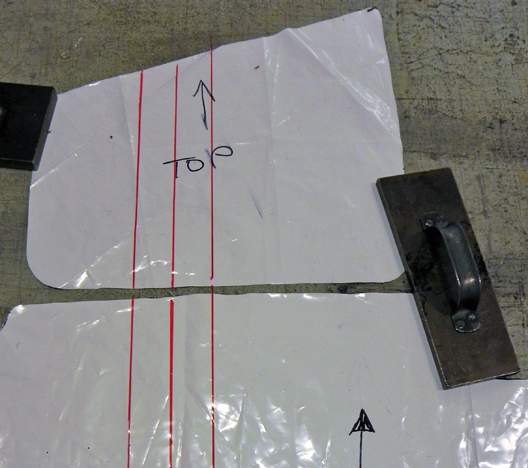 Making a Template for an AquaMat® made with Teak R2861 carpet requires an extra step other templates don’t. As long as you know this step going in, it’s as easy as pie! The key is to make guidelines for us to make sure the ‘boards’ of the Teak run true. Use a straightedge to draw a few lines entirely through each piece and onto any neighboring pieces. The lines where they meet allow us to line up the ’planks’ as they run from one piece to the next and the lines going all the way through help us make sure they run true from bow to stern. That’s all it takes to ensure a beautiful finished product!